This mobile party is one of a host of large-footprint events that, with the enticement of obstacles, tutus and tiaras, color, costumes and other regalia, draw large crowds of runners, would-be runners and never-run-a-day-in-my-lifers alike into an "experience" event that is loosely-based around running a 5K, and firmly-based around a good party. While I tend to shy away from such mega-events, a few YouTube videos and one-mile training runs got my kids hooked on the idea and my entire family found ourselves participating in the colorfunfest5K last night. We arrived late that afternoon, wearing white shirts, fancy socks, and old clothes - not sure exactly what to expect. Thousands of families, couples and groups of friends joined us as we filed into the San Jose Fairgrounds and towards the soundstage. There were lots of tutus, one man in a fat suit, and plenty of full wattage smiles. Each of us was handed a packet of "color" which my kids liberally applied to themselves and me while dancing around to the music and watching the GoGo dancers on stage. As the sun began to set, everyone released additional packets of "color" into the air and the run began. 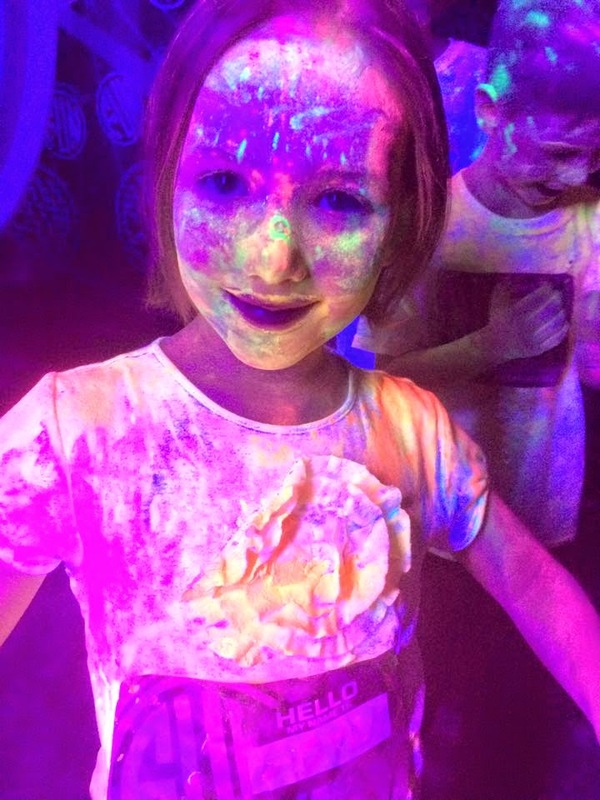 The course weaved back and forth throughout the fairgrounds, with color stations (i.e., picture vats of "color" that you reach into to throw on each other and blacklights), water stations, and "short-cuts" throughout. Given the deepening darkness and the draw of the color stations, we made liberal use of the shortcuts which allowed us to hit all the high points and allowed my 3YO to run the whole way - which was fun for us and great for his confidence. We ran together through the finish chute, played in the blacklights, danced with the girls twirling lighted hula hoops and fell exhausted into our car at 7 PM. Sitting in a bath that was purple with color my son announced I did great on the color run! and he and his sister are already making plans for next time. Certainly, if it takes a few events like this to get my kids psyched about doing 5Ks, I guess that is small sacrifice to make - and a pretty fun one at that.